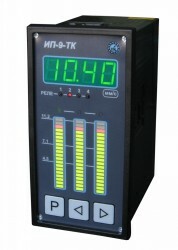 receiver by modern digital measurement systems. Listed in the State Register of Measurement Instruments of Ukraine. Potentiometric sensors signals measuring and conversion. Digital RS-485 interface and current output. Device is developed for turbine destruction protection. Measuring pressure difference and determinates relative power of turbine stage.